A pair of unbeaten will square off with a date in the state semifinals on the line as West Elk makes the long trip to take on state-power Hanover. West Elk has raced out to a 10-win season behind an explosive offense that has scored more than 42 points in all but one game. Headlining the Patriot’s roster is one of the state’s top recruits in 6-foot-7, 285-pound Isaiahh Loudermilk. A superb athlete, Loudermilk plays offensive and defensive line, lines up at end, and plays middle linebacker for the Patriots. He is West Elk’s leading receiver with seven catches for 163 yards and five touchdowns. To put that in perspective, the Patriots as a team have only completed 20 passes for 314 yards and seven touchdowns. Loudermilk mainly opens holes for senior back Armando Gomez and sophomore Cade Miller. Gomez (5-9, 180) has had an exceptional career at West Elk. Earlier this season, Gomez topped the 1,000-yard mark for the third consecutive season. This fall, Gomez has 1,504 yards and 32 touchdowns. He is now over 4,200 rushing yards for his career with 77 touchdowns. Miller, a quarterback, has rushed for 1,024 yards and 21 touchdowns, while throwing for 302 yards and seven more scores. Loudermilk leads the defense with 92 tackles, two sacks, two intercpetions and four blocked punts. Moving him to middle linebacker had made it more difficult for opponents to run away fro him. Hanover will be a different challenge. 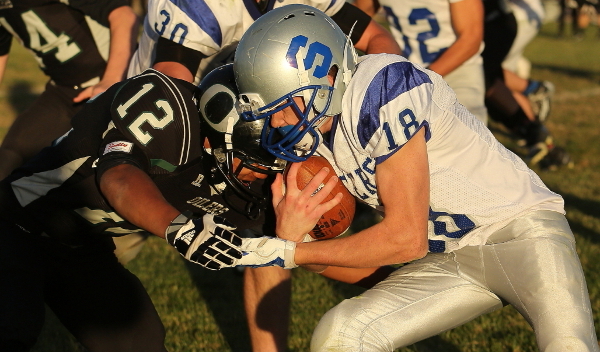 The Wildcats fell short in state championship game last fall, losing to Central Plains 42-30. Hanover graduated all but two, defensive starters from that team. The Wildcats reinvented themselves this season utilizing the right arm of junior quarterback Will Bruna. Bruna is threatening the eight-man, single-season state passing record of 2,837 set by White City’s Michael Hammersmith in 2000. Bruna enters Saturday’s game having completed 153 of his 201 pass attempts for 2,637 yards and 47 touchdowns against only four interceptions. Bruna needs 200 more passing yards to break Hammersmith’s state mark, and five more touchdowns passes to tie the single season state mark of 52 set by Central Burden’s Bo Savage in 2010. Bruna also leads Hanover in rushing yards with 471 and has scored 13 touchdowns on the ground. The Wildcats pass the ball on nearly 60 percent of their snaps. Bruna has four main receiving targets led by senior Trey Lohse with 833 receiving yards and 19 touchdown on 41 receptions. Senior Matthew White has 27 catches for 596 yards and nine scores, while junior Adam Zarybnicky has a team-high 45 catches with 583 yards and nine touchdowns. Senior Devin Jueneman has 38 receptions for 579 yards and ten scores. The Hanover defense has given up only 116 total points in ten games this season; good for fourth best in the classification. Possibly the de facto state championship game, Central Plains and Spearville square off after a second-round classic in 2014. In an outcome that remained in doubt until the final seconds, Central Plains held off Spearville in a 42-40 and went on to capture the state crown. This season, Spearville has rolled through all 10 opponents, while Central Plains has nine straight blowout victories after a season-opening 16-12 road loss versus 8M-II No. 1 Victoria. Spearville stands No. 1 in defense with 52 points allowed, while Central Plains is second at 60. No other squad is under 104. The Lancers are fifth in offense with 532 points, and the Oilers stand seventh with 522 points. Spearville’s single wing has amassed 292 total yards, including 227 rushing, and 10.3 yards per play. Senior quarterback Nathan Stein (579 passing, 552 rushing) has accounted for 27 scores. Junior Luke Heskamp has rushed for 864 yards and 18 touchdowns. Spearville has yet to commit a turnover. Senior Elias Brownlee paces Spearville with 48 tackles and three fumble recoveries. Central Plains averages 133 rushing and 104 passing yards with 7.7 yards per play. Senior Braedan Crites has completed 67 of 123 passes for 1,021 yards with 23 scores versus four interceptions. Senior Jacob Warnken has 443 rushing and 11 scores. He leads the team with 101 stops. Seniors Michael Ryan and Trustin Kreft along with junior Trey Schulte, have 31 tackles for loss. The Oilers, like last year, have forced 30 turnovers and are plus-21 in the turnover margin. The start and first quarter should play a big role. Last season, Central Plains forced a turnover on Spearville’s first offensive snap and finished with four forced turnovers and plus-2 in turnover margin. Spearville entered the contest with five turnovers. This season, Spearville has blown teams out in the first quarter with a total score of 274-34 after the first 12 minutes. Only South Central – a 6-6 tie in Week 2 – has stayed within 22 points of the Lancers after the first quarter. However, Spearville eventually won 52-6 against the T-Wolves. This could go down as another classic, but Spearville’s defensive improvement from 2014 and dominance early leads to a win. Central Plains will likely have to win the turnover battle to have a chance.